An Eastman education is founded upon the highest standards of artistry and scholarship. Guided by George Eastman’s vision to educate the whole musician, world-class faculty members help students reach their creative and professional potential. Young musicians who graduate from Eastman leave as artists, leaders, educators, and innovators. Scholarships Initiative – Endowed scholarships are our most critical need as they allow us to attract the most talented and deserving undergraduate and graduate students. Faculty – Supporting our greatest asset through endowed professorships and other funding, allows us to build on our reputation by retaining the talented professors that we have and attracting outstanding new faculty from around the world. 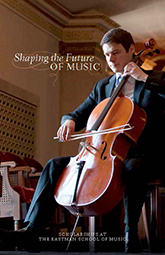 Special Programs – To remain at the forefront of educating musicians of the future, we must continue to develop innovative programs, such as the Institute for Music Leadership, to respond to and help shape America’s changing musical and cultural environment. Facilities – Naming opportunities are available for donors interested in providing support to enhance the school’s spaces where students practice, perform, study and live. Name a seat – Leave a legacy or honor a mentor or family member by naming a seat in one of our concert halls. Seats are available in Kodak Hall, Kilbourn Hall, and Hatch Recital Hall. Contact the development office to learn more. Eastman Fund – The life-blood of any educational institution, gifts to our Annual Fund provide much-needed resources to sustain the Eastman experience.